Fighting through rampant illness, then enduring a bus trip to the wilds of Granite Falls Tuesday, the Coupeville Middle School girls basketball teams closed their seasons with a bang. Two wins, one of which capped an undefeated season for a Wolf squad, and a narrow loss in the third game, was the order of the day. Granite came out swinging (literally), but was no match for the Wolves, who cruised home with a 44-26 win to seal the deal on a flawless 9-0 season. 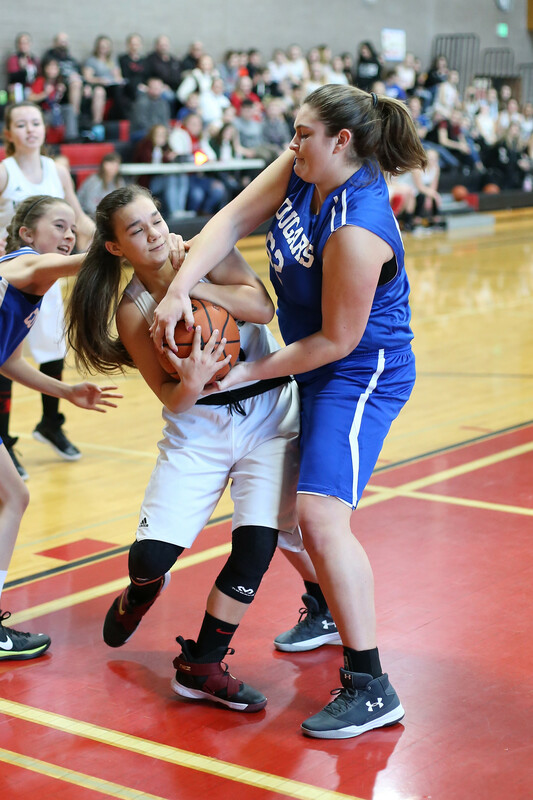 As the game progressed, at least three Coupeville stars were left seeing … stars, as Alita Blouin took an elbow to the eye, Maddie Georges had her nose rearranged, and Gwen Gustafson was body-slammed to the floor. That last melee drew a technical foul on the hosts, but all the bangs and bruises in the world were no match for the high-flying Wolves. Blouin, living up to her nickname of “The Assassin,” rained down unholy pain on Granite, torching the joint for a season-high 15 points. The slash-and-destroy guard scored in every quarter, tossing in five field goals, ruffling the nets for a pair of free-throws, then stabbing Granite through the heart with a three-ball. Coupeville is far from a one-woman team, however, with its top four scorers finishing within nine points of each other this season. Tuesday, while Blouin was slashing to the hoop and popping from outside, Coupeville’s dominant post players, Carolyn Lhamon and Nezi Keiper, were the perfect complement, throwing down 11 and 10 points, respectively. Up 10-7 at the first break, with four players already in the scoring column, the Wolves steadily built the lead from there. With coach Alex Evans pulling all the right strings, and every player on the floor attacking relentlessly, CMS surged to a 23-12 lead at the half, before shoving the margin out to 35-19 heading into the fourth. Seven of the 10 players to see action scored, led by the trio in double figures. Georges, Gustafson, Ryanne Knoblich, and Jill Prince rounded out the attack, with a bucket apiece, while Hayley Fielder, Jordyn Rogers, and Jessenia Camarena also saw floor time. The only loss of the day, but a nail-biter until the end. The 24-19 loss drops Coupeville’s final record to 2-8, but that’s a bit deceptive. Smith’s top two scoring threats, Brionna Blouin and Lauren Marrs, only played together six times during the 10-game schedule, as illness had other plans for the Wolf duo. Tuesday was one of those six games, and they proved how potent they can be when they get a chance to work together. Marrs went off for a game-high 13, scoring in every quarter and netting a three-ball, while Blouin returned from sick leave to bank in six points in support. The game was knotted 8-8 after the first quarter, with Marrs having already scored in every possible way, hitting a trey, a field goal, and a free-throw. The offense slowed down a bit in the second quarter, with Granite holding a 6-2 advantage, and that would prove to be a killer for the Wolves. The two teams battled almost evenly across the final 14 minutes of the season, but the Tigers stretched the lead ever so slightly with a 6-5 third frame, before the teams closed with a 4-4 stalemate in the final quarter. Smith got quality floor time for every one in uniform, with Jackie Contreras, Reese Wilkinson, Allison Nastali, Erica McGrath, Kaitlyn Leavell, Desi Ramirez, Skylar Parker, and Kayla Arnold chipping in with defense and hustle. Someone check what Jessenia Camarena had for breakfast, because she was unstoppable. Pouring in a season-high nine points in just two quarters, the defensive dynamo transformed into an offensive whirlwind, pacing Coupeville to an 11-8 win. The victory, which comes after the JV had to sit out back-to-back games, thanks to other schools battling their own spring cold and flu season, lifts the Wolves final record to 3-5. While she got a bit of help from Claire Mayne, who slipped through the Granite defense for a first-quarter bucket, this was Camarena’s game, from start to finish. She tossed in two buckets to go with Mayne’s basket, as CMS built a 6-2 lead after one quarter of action. Not content to stop there, Camarena knocked down another field goal, and a three-ball, to account for all of Coupeville’s scoring in the second, and final, frame. Setting her up for the offensive explosion were her teammates, who harassed the Granite ball-handlers and hit the boards with intensity. Karyme Castro, Abigail Ramirez, Mercedes Kalwies-Anderson, Adrian Burrows, Prince, Rogers, McGrath, and Contreras rounded out the active roster.